Rhode Island seniors who take part in regular leisure activities can enrich their lives in many ways. Participating in such activities is exciting, and it can also enhance a senior’s mind, body, and outlook on life. Check out the following five local leisure activities that seniors will truly enjoy. Seniors who love gardening and socializing can join the Edgewood Garden Club. They meet the second Wednesday of the month at the William H. Hall Free Library at 1825 Broad Street in Cranston. Seniors can have a good time mingling and sharing their expertise with other fellow gardeners while doing projects ranging from decorating the library to planting bed gardens at local schools. Gardening can keep a senior’s mind active, and it’s also a low-impact way to get physical activity. After seniors attend one meeting, they can apply to join the club. Dues are $30 per year. Gardening is a great activity for seniors with few physical limitations, but those living with serious health conditions may require extensive assistance. Seniors can face a variety of age-related challenges. Though some families choose to take on the caregiving duties, there may come a time when they need a trusted Rhode Island in-home care provider. Families sometimes need respite from their duties so they can focus on their other responsibilities, and some seniors need around-the-clock assistance that their families are not able to provide. Home Care Assistance is here to help. The Davisville Free Library in North Kingstown hosts a reading club on the second Wednesday of the month at 6:30pm. This club features a book of the month that was turned into a movie. Seniors will discuss both versions with the group and give their opinion of why they liked either the movie or the book better. Joining a book club is a wonderful way for older adults to make new friends, stay sharp, and boost their self-esteem. This book club provides free popcorn, and seniors can also bring dinner or a snack. The Auburn Branch of the Cranston Public Library at 396 Pontiac Avenue offers adult coloring classes every Friday from 4:30pm to 5:45pm. Seniors can begin the weekend relaxed by doing some coloring while enjoying decaffeinated or herbal tea with soothing music playing in the background. The health benefits of coloring go beyond relaxation. When seniors color, they exercise their fine motor skills and train their brains to focus. Coloring books, markers, pencils, and mandalas will be available. The Johnston Senior Center at 1291 Hartford Avenue offers bingo games on Thursdays at 1:30pm and Fridays at 5:30pm. There is a jackpot buildup at both games. Playing bingo can enhance a senior’s hand-eye coordination, boost his or her cognitive abilities, and encourage socialization. Refreshments will be available during the games. If you’re planning leisure activities for your aging loved one, you may need to take a break from your caregiving duties. Whether your elderly loved one needs part-time assistance with basic household chores or you need a break from your caregiving duties, the Rhode Island respite care experts at Home Care Assistance are here to help. All of our respite care services are backed with a 100% satisfaction guarantee, there are no hidden fees in our contracts, and we never ask our clients to sign long-term contracts. The Lincoln Senior Center at 150 Jenckes Hill Road hosts a knitting and crocheting group on Thursdays at 1pm. Seniors can begin a new project or get help completing an old one, share their ideas with other fellow knitters or crocheters, and get the chance to mingle with new people. 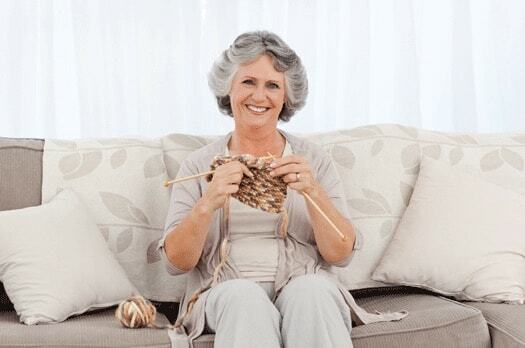 Knitting and crocheting can help seniors reduce their stress and boost their mood. If your aging loved one wants to participate in leisure activities such as these and requires transportation or a social companion, consider hiring a dedicated caregiver. When searching for reliable Rhode Island home care agencies, families want to know their senior loved one will be well taken care of. At Home Care Assistance, our expertly trained caregivers are available around the clock to assist with tasks around the house, provide transportation to medical appointments and social events, and much more. To create a customized care plan for your elderly loved one, call Home Care Assistance at (401) 284-0979 today.